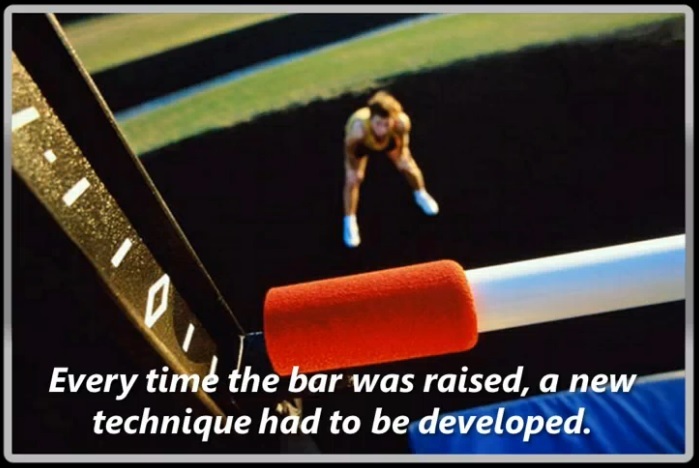 Most of this video goes through the Olympic high jump competition and shows how the world records kept improving as the bar was raised and different techniques needed to be developed to successfully traverse greater heights. 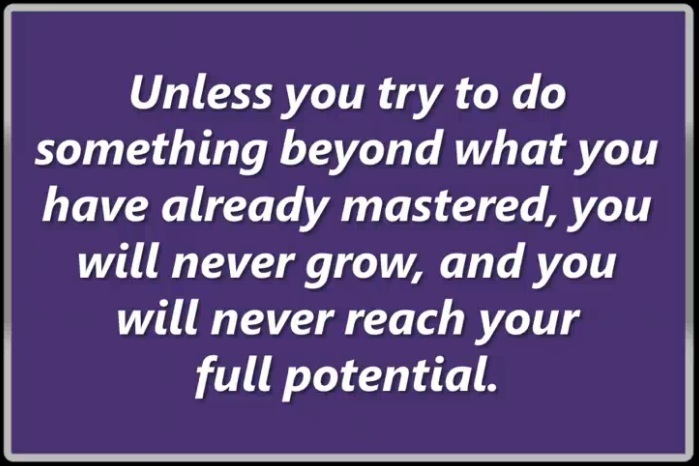 The analogy being if metaphorically you want to raise the bar in your own life you will also need to develop new techniques. I was one of 53,723 people who got to witness the St Louis Cardinals win game 7 of the 1982 World Series against the Milwaukee Brewers. I distinctly remember driving to that game because the wire coathanger fix that was holding up the exhaust system in my 1976 Plymouth Arrow finally gave way and the muffler, which was starting to drag along the road as I drove, completely detached from my car. I remember looking into my rear view mirror and watching the whole thing – pipes, muffler and all bouncing down the road behind me. Thinking back, as a responsible citizen I probably should have stopped my car and gone back to remove the muffler & pipes from the road but, as a young and enthusiastic Cardinals fan on his way to the World Series …I don’t think that thought crossed my mind at the time. The Cardinals also went to the World Series in 1985 & 1987 that decade. Contrary to what the history books might tell you about the 1987 World Series against the Kansas City Royals winning in 7 games – the TRUTH is that the Cardinals won that series in 6 games if not for the inept first base umpire Don Denkinger who, in the bottom of the 9th inning of game 6 mistakenly called Jorge Orta of the Royals safe at first base when he was CLEARLY OUT. one moment …. The ball is ALREADY in Todd Worrel’s glove! Jorge Orta is obviously OUT! The blown call occurs in real time at 2:27 in the video but at 3:03, 3:13 and 3:24 – any way you look at it, Orta is out. This was a 1-0 game with the Cardinals leading and only 3 outs away from a World Series victory. After this play they should have been 2 outs away from a World Series win. There is a huge world of difference between having 1 out and nobody on base as opposed to zero outs and a man on first. I suppose there is a legitimate segway between the success orientation of this blog and the St Louis Cardinals but honestly, I think I also just wanted to brag. Bill DeWitt Jr took over as principal owner of the Cardinals in 1996 and had a vision of sustained success. I would really like to know more about that vision and exactly what details it involves. Under DeWitt, the Cardinals have advanced to the playoffs 12 times, moved onto the National League Championship Series 10 times and played in the World Series on four occasions. Their 63 postseason wins since 2000 is the most among any team in Major League baseball. Sustained success is a nice concept and maybe not that it’s on the board I can start pondering the topic, asking myself questions about it and maybe come up with some rational answers. The Cardinal Way is another theme talked about at times when referring to the St Louis Cardinals. So far, the best I could find out about that concept is from Wikipedia’s mention of George Kissell (1920-2008) who spent 69 years with the Cardinals organization. His influence is generally regarded as being a major basis for what has come to be known as the “Cardinal Way”. George also mentored major league managers including Sparky Anderson, Joe Torre and Tony LaRussa. According the Don Denkinger, the first base umpire. He basically had his eye on the bag and his ear on the glove – that is, he was waiting to see which came first – either hearing the ball hit the Todd Worrel’s glove or seeing Orta’s foot hit the bag. I’m not sure how anybody could expect to hear a tossed ball with 53,000+ screaming fans in …what should have been …the last game of the 1985 World Series. Another little factoid and reason I love the St Louis Cardinals – they are a middle of the pack team in terms of payroll but a leader of the pack in terms of results. This year – the Cardinals made do with with a payroll less than HALF of the Dodgers – $253.3 million vs the Cardinal’s $111.25 million. And Todd Worrel – had he actually struck out Orta would have been the first picture in major league history to strike out 7 consecutive batters in two games in the history of World Series Play. Tommy Herr got screwed too in the 1987 World Series with a bad call but it wasn’t necessarily a game changer like this 1985 blown call. With over 160 games in the regular season, I’m not sure how much instant replay is needed since things like bad calls can kind of work themselves out but, maybe for the World Series it might be more appropriate. This entry was posted in 100 Day Challenge, achievement and tagged 1985 world series, achievement, beginner, blown call, c25k, cardinals, chiropractic, Denkinger, Don Denkinger, exercise, fitness, jogging, Jorge Orta, kansas city royals, kc, life, marathon, marathon training, Milwaukee Brewers, Raise the Bar, running, st louis cardinals, the Cardinals, Todd Worrel, training, underdog, victory, weight loss, world series, zerotohero. Bookmark the permalink.